When I was doing my training on Intensive Care Medicine, already nearing the end of the specialty, I had the honour to do the farewell speech after that five years. The IC-HU Project is focused on people: patients, families and professionals. In fact, one of the lines of work is the care of healthcare providers. Retrieving the vocations, encouraging professionals, preventing the Burn-Out syndrome to which we are so exposed, especially in areas as ICU or the emergency. Dr. José Manuel Gómez García, expert in burn-Out, says in the ICU Humanization Plan of the Goverment of Madrid, that society and organizations have the duty moral, the imperative ethical and the obligation legal of “care to their caregivers”, which are exposed to important loads, both physical, emotional and psychological derived of our dedication and effort. 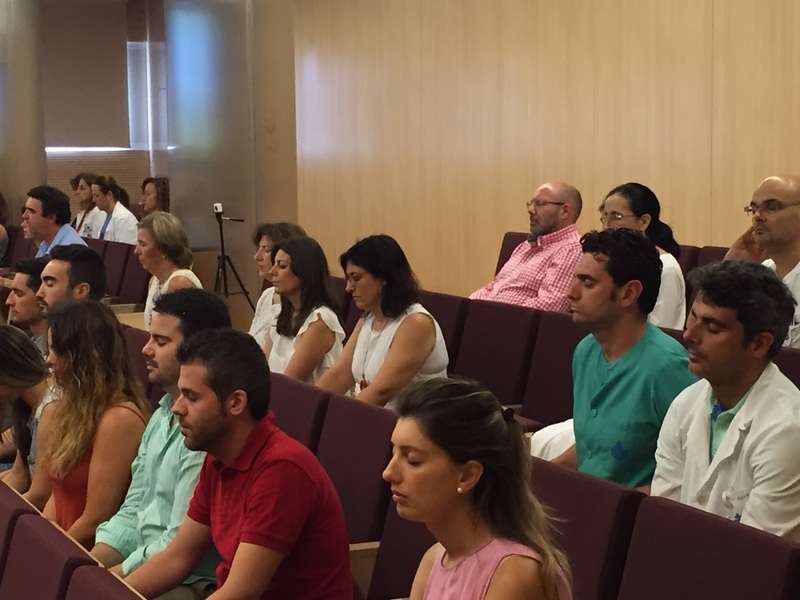 In the last National Conference on Humanization in Barcelona (#2JHUCI), Marisol Martínez, ICU Trauma nurse at Hospital 12 de Octubre, delighted us with a lecture titled “Yoga and Mindfulness in the ICU”. The most important thing is not to remedy the problem (which also it is)… What is really important, is to put the resources to prevent its occurrence. We have to make burn-out syndrome dissapear! The past June 28th at Hospital San Juan de Dios de Córdoba, we organized the Conference “Taking care of those who care”, inviting to the healthcare providers of the province of Córdoba. Seeking to raise awareness about something that is dozing… And doing it with something out of the ordinary… Looking for modernity, update and trend (it´s curious say this about an ancient practice as mindfulness). In it, after talking to the assistants our idea on “The Care of invisible”, Samuel Lopez de la Iglesia, expert in Mindfulness and personal development, gave us a Masterclasss intended to teach the way in that Mindfulness could help to prevent the burn-out syndrome of the professionals. It was a pleasure to see people come from across the province, hospitals, healthcare centers, official and private statements, including patients… To close the eyes and follow the instructions of Samuel with the sea playing in the background… Listen to the silence… And more pleasure that people before leaving told us they really enjoyed and wanted more. When will we have a room of relaxation, meditation, of evasion? When will we have a professional to help us in the management of the emotions? When will we work in the burn-out syndrome detection? What about the prevention? When will we have a slap in the back? Any acknowledgement? What about…how are you? Would you like to tell me what you think we must change? When a day of gift? And the promotion of activities on the personal development and happiness in group inside and out of the Hospital?. I have it… But we should have it all. Show me you love me… And I will give you the world. Head of Emergency and ICU.